‘C-row bar?’ he repeats after me. I convince myself that I need to explain the 2 words for this tool. I ponder in my own head – ‘Why is it called a crow bar?’ I understand the ‘bar’ and I explain that to ‘E’, an asylum seeker from Eritrea waiting for Home Office approval. But why a crow? – must be the bird beak, looks like the nail pull of the crow-bar! 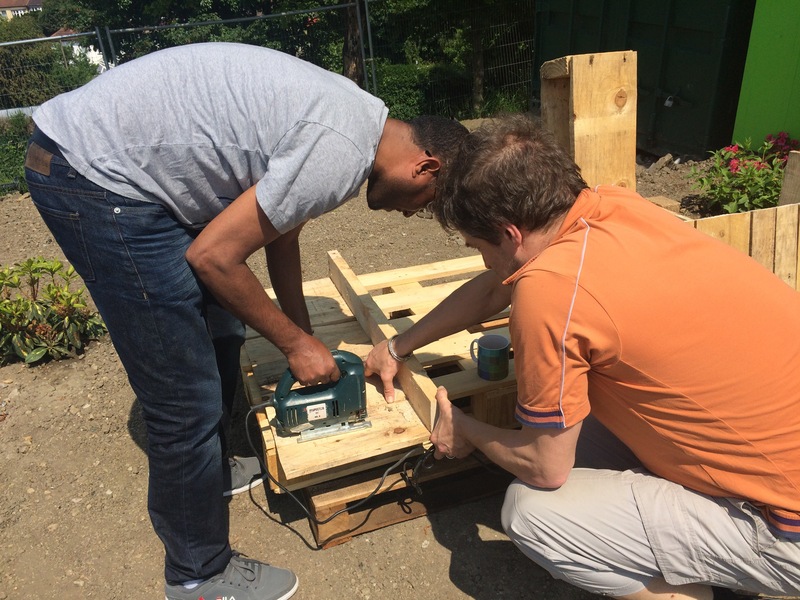 E is softly spoken and gentle in his manner – we find ourselves working together to upcycle some wooden pallets, using the wood to clad an old shelving unit to turn it into an island from which to serve future customers. He then asks what we are making. I explain an island, referencing the UK in the middle of the seas. He understands, then later comes back with some confusion as to whether it is ‘Island or Iceland’ – I have my own fascination for language and explain. He tells me about life in Eritrea – military service is compulsory for everyone there, male & female – and it’s difficult to get out of Army Service there. It took him two years to get from Eritrea to England via the routes we have sadly become used to hearing, across the Arab countries in Northern Africa, across the sea to Italy, France, the Calais Jungle and here about 6 months ago. He helps me and I help him as we saw our way through 2 pallets – measuring, marking, planning and building this bespoke structure. He is keen to drill and saw and is so happy to be of help. He tells me how creative I am and that everything looks good! I spend about three hours at TLC Café today, most of which is spent with E – but today is when there are many people who have come to offer their time and help – how lovely to meet Anita, an Albanian refugee whose presence is key to the culmination of this ‘project’ and whose own status is still awaiting approval. She is there with two other Albanian women and their gorgeous babies. Another lady was there; recently arrived from South Africa about 6 months ago to be part of the Jewish community here. Her recycling & upcycling ideas are invaluable at this stage of the café. TLC offers hope to everyone who has come for so many reasons – what is more important than sharing a coffee and cake, or sharing your time making something together so that others can enjoy? And of course, actually making friends. And what do I get out of spending a few hours supporting the project? I thought I had come to build a kitchen island – but I realise that the building comes a distant second to the relationship that we are building together after just a few hours. We arrange to meet on Tuesday to finish it off and I am already looking forward to finding out more..
Fabulous blog Lawrence. It was lovely to see you at TLC on Tuesday and I’m looking forward to seeing the progress.